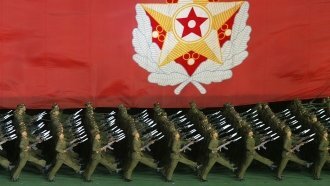 North Korea celebrated its most recent missile launch. Here's the Hwasong-14's range and what it means for U.S. national security. North Korea's nuclear capability is the country's most closely guarded secret. Consequently, there's a lot we don't know. It's unclear if leader Kim Jong-un's missiles could survive re-entering the Earth's atmosphere. It's also uncertain if the North can develop a nuclear warhead small enough for its missiles and how such a warhead would affect the missiles' trajectory. But here's what we do know about the intercontinental ballistic missile that's made headlines recently: the Hwasong-14.